People often lose money in the markets because they don’t understand economic and investment market cycles. Business and economic cycles expand and decline. The boom cycles are fostered by a growing economy, expanding employment, and various other economic factors. As inflation creeps up, prices rise, and GDP growth slows, so too does the stock market decline in value. Investment markets also rise and fall due to global events. After 9/11 the stock market fell 7.1 percent, the biggest one-day loss in the exchange. By Friday, September 15, 2001, the New York Stock Exchange had dropped 14 percent while the Dow Jones and the S&P 500 fell 11.6 percent. If you sold during the week following 9/11, your investments most likely would have lost money. But if you’d held fast and done nothing after the decline, you would have been rewarded for your steadiness: Within a month of the attacks, the Dow Jones, Nasdaq, and S&P 500 were back to where they were before the attacks. To avoid losing money during a market-wide drop, your best bet is to just sit tight and wait for your investments to rebound. People lose money in the markets because they let their emotions, mainly fear and greed, drive their investing. 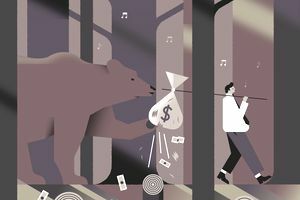 Behavioral finance—the marriage of behavioral psychology and behavioral economics—explains how investors make poor decisions. Understanding basic behavioral finance concepts and learning to manage your emotions can help you avoid a good deal of losses during your investment lifetime. In investing, following the herd mentality is one of the worst behavioral finance mistakes, and it plays out whenever you follow the investing crowd. Herding in investing occurs when you make investments based on whatever choices "the group" is making, without performing your own evaluation of current information. In the late 1990s venture capitalists and individual investors were pouring money into internet dot com companies, driving their values sky high. Most of these companies lacked fundamental financial stability. Investors, afraid of missing out, continued to listen to the popular press and follow the herd with their investment dollars. A glance at historical S&P 500 stock market returns shows how buying and selling with the herd can damage returns. To avoid losing money in the markets, don’t follow the crowd and don’t buy into overvalued assets. Instead, create a sensible investment plan, and follow it. People lose money in the markets because they think investing is a get-rich-quick scheme. You can quickly lose your investment dollars by heeding the outrageous claims of penny stock and day-trading strategies. A recent Dalbar study showed how investors are their own worst enemy. From 1997 through 2016, the average active stock market investor earned 3.98 percent annually, while the S&P 500 index returned 10.16 percent in returns. The reasons are simple: Investors try to outsmart the markets by practicing frequent buying and selling in an attempt to make superior gains. To avoid losing money in the markets, tune out the outlandish investment pitches and the promises of riches. As in the fable of the Tortoise and the Hare, a “slow and steady” strategy will win out: Avoid the glamorous “can’t miss” pitches and strategies, and instead stick with proven investment approaches for the long term. Though you might lose a bit in the short-term, ultimately the slow-and-steady approach will win the financial race. Barbara A. Friedberg is a former portfolio manager and author of Invest and Beat the Pros-Create and Manage a Successful Investment Portfolio. Her writing appears on various websites including Robo-Advisor Pros.com and Barbara Friedberg Personal Finance.com. Scared of Investing in the Markets? Here's How to Get Over It.